RRB made the Bank Account Correction link active on 22nd March 2019. RRB was not able to start the refund procedure earlier due to lack of information provided from the candidates’ side. Now RRB has given one more opportunity to candidates to provide the correct bank account details. Note that the Last Date to provide the bank details is 28th March 2019. Step 1 -Go to the Bank Account Correction Link. Step 2 -Select the RRB Region. Step 3 -Enter your Registration Number. Step 4 -Enter your Date of Birth. Step 5 -Enter the captcha correctly. Step 6 – Enter the correct bank accounts in order to avoid any discrepancies in the future. Railway Group D employees will get level 01 of 7th CPC Pay Matrix with initial pay of ₹18000/- plus other allowances admissible at that time. Step 1 Go to the official RRB website of the concerned region. 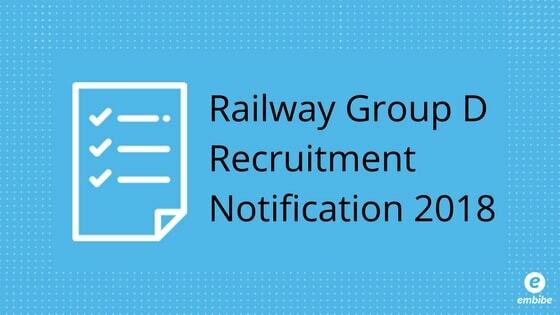 Step 2 Click on the link for “Railway Group D Recruitment Notification CEN 02/2018”. Step 3 Read the instructions and click on “Apply Online”. Step 4 Click on “New Registration” and fill up all the required details – personal, academic, and contact details. Step 5 Upload the required scanned images (photography, signature, etc). Step 6 Make payment of Railway Group D application fee and submit your online application form. Step 7 Take print out of your application form for future reference. After that, documents of the selected candidates will be verified and candidates will be recruited. Railway Group D Admit Card and Railway Group D Result will be issued on the official regional websites of the RRB. The respective dates will be updated here once it is published by the RRBs. Although Railway Group D exam is quite easy, it is highly competitive and hence, candidates must score as high as possible. Taking banking mock tests will definitely be advantageous for the candidates. We hope this detailed article on Railway Group D recruitment helps you. For any query regarding the exam, feel free to comment below. We will get back to you. Is it very difficult to work in group D..